The 2015 Instruct Biennial Conference was, by all accounts, a great success. A raft of world leading speakers presented exciting new advances in research using various structural approaches to an audience of almost 200. Hosted by CERM at the magnificent Convitto della Calza in Florence, Italy, a highlight was the first Ivano Bertini Award to Stephen Cusack FRS for his work on large scale protein-RNA complexes. 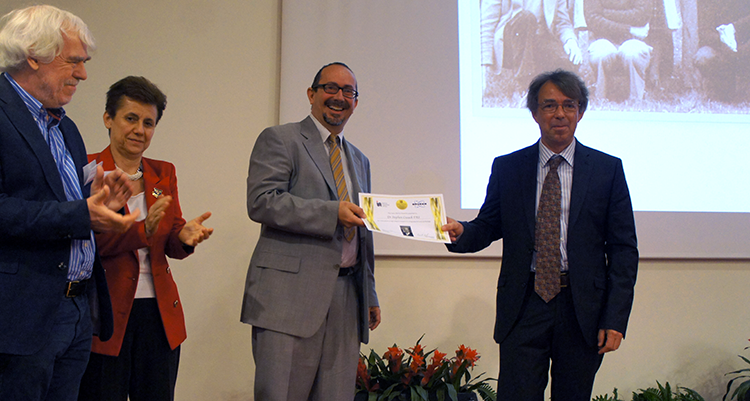 The award was particularly poignant in commemorating Ivano, who set up NMR in Florence and went on to establish CERM and CIRMMP, both of which are now world-leading centres in advanced NMR methods. The successes of Instruct in delivering access to the researcher community was demonstrated by the posters showing results from access visits through Instruct, many of which have now been published. In fact, the number of publications acknowledging Instruct (now more that 160 peer reviewed papers) prompted regular comment on this success metric for providing impact through Instruct activities. More posters showed the fruit of some of the R&D Pilot awards which have likewise been very successful. The overall impression of the meeting was summed up by Prof Markus Gruetter who gave his summary of the conference and remarked on the unprecedented progress in the last year – not only in delivering access and other activities to the European research community, but in maturing into a well organized, enthusiastic and increasingly well used research infrastructure. With an ERIC application in progress, Instruct is well on the way to becoming a major provider of structural biology access in Europe, and is now looking beyond the European borders to new opportunities. The 3rd Instruct Biennial Conference will take place in Brno, Czech Republic in 2017.